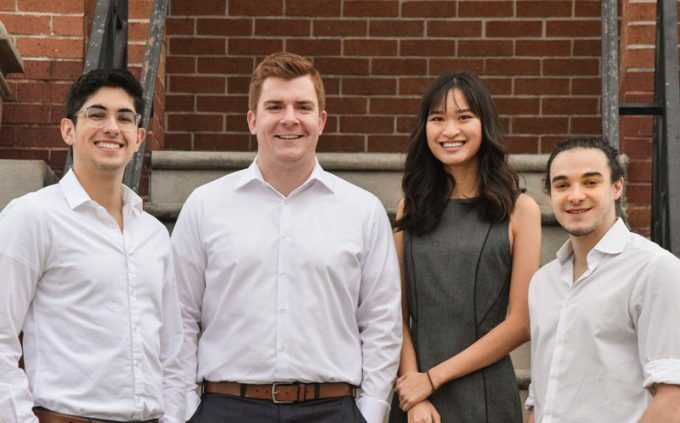 Forbes has recognized (from left) Christian Kladzyk, Brad Cathcart (now over-30 co-founder), Viviane Nguyen, and Juan Pablo Pimienta, for PolarPanel, a battery-free solar refrigeration technology, on their 2019 “30 Under 30” in Energy list. Photo courtesy of Alex Bishop. | Photo Editing: Anne Yu. Forbes has recognized a group of entrepreneurship students from the C. T. Bauer College of Business for their energy startup company that aims to address the impact of climate change in a segment of the transportation industry. The students, all part of the college’s Wolff Center for Entrepreneurship, landed a spot in the publication’s 2019 30 under 30 list. The annual list highlights rising entrepreneurs in the United States and Canada, featuring 600 trailblazers in 20 industries. The Bauer student team is included in the 30 Under 30 Energy list. Viviane Nguyen, Christian Kladzyk and Juan Pablo Pimienta, along with now over-30 co-founder Brad Cathcart, were recognized for PolarPanel, a battery-free solar refrigeration technology that stores excess energy as ice to maintain temperatures without sunlight. The startup is adapting this technology for use in the refrigerated transportation industry to curb the financial and environmental impact of diesel generators. The process behind the technology was patented by NASA by inventors David Bergeron, CEO, SunDanzer Refrigeration Incorporated; and Michael Ewert, Life Support and Thermal Systems Analyst, NASA. In addition to the Forbes honor, the group has earned awards and funding in several business plan competitions, including MIT Clean Energy Prize competition, the Department of Energy National Cleantech University and the Queen’s Entrepreneurship Competition. PolarPanel is the second startup from the Wolff Center to be recognized on the Forbes Under 30 list, with Casey McNeil (BBA ’14) being recognized in 2015 for REEcycle, a technology that extracts rare earth elements.